Shopping for health insurance is a bit like buying a plane ticket. Just like you compare options to find the cheapest flight that still gets you to your destination smoothly, you want to find the health plan with the best coverage at the lowest price. The problem is there’s no Orbitz or Expedia for health insurance. 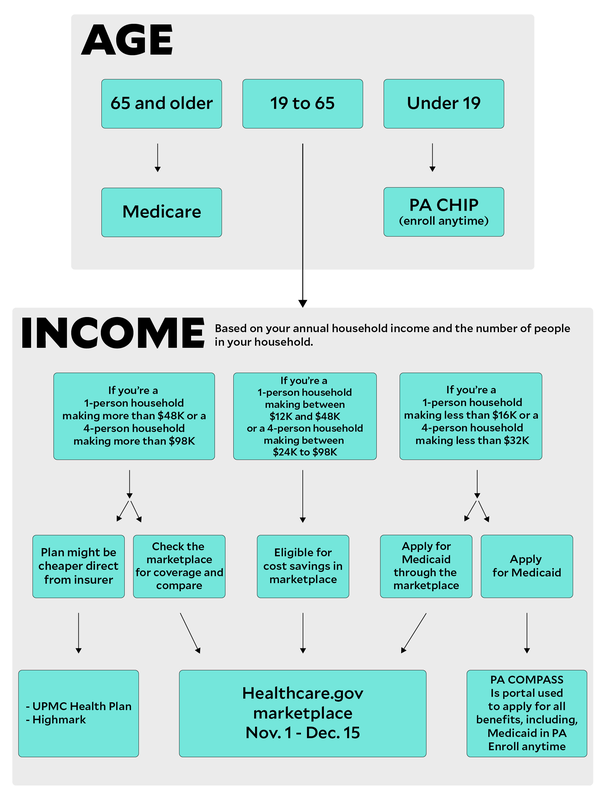 With the 2018 open enrollment period here, we compiled a guide below to help residents of Pittsburgh and Allegheny County choose the best health insurance plan. The open enrollment period runs from Nov. 1, 2017 to Dec. 15, 2017. In Allegheny County, there are 34 different plans available on the HealthCare.gov marketplace, primarily offered by two providers: UPMC Health Plan and Highmark. The health insurance plans available to you and their prices change based on your age and income. Preexisting conditions are covered. You cannot be denied a plan in the marketplace based on a preexisting condition. Have an insurance plan through the marketplace? If you do nothing, you will be re-enrolled in the same plan. Due to several changes, you may want to shop around before re-enrolling because you could get better coverage for less. Follow our guide below for more explanation of the options and available resources. Have any questions? Email them to Lindsay@publicsource.org and we’ll try to direct you to an answer. Can’t I just change my health insurance any time? No. The open enrollment period, which ends Dec. 15, is the designated time frame to enroll in or change your health insurance coverage for 2018. Outside of this period, you can only change your insurance under a few special circumstances, such as a birth of a child or loss of job. Are there ways to get health insurance other than in the federal marketplace? Health insurance plans from the federal marketplace. Find these plans at www.healthcare.gov. You can buy direct from the health insurance providers. In Allegheny County, that’s only UPMC Health Plan and Highmark. You can shop directly from UPMC Health Plan or Highmark, use a broker or shop one of the other online marketplaces such as ehealthinsurance.com. Employer-provided plans: Your employer may choose a plan and make a contribution toward the premium. No insurance: The Affordable Care Act stipulates that everyone must have qualifying health coverage or pay a fee equal to 2.5 percent of your income or $695 per person, whichever is higher. The maximum fee is $2,085 per person. Medicaid: Free or low-cost health insurance coverage for some low-income residents. Medicare: Federal health insurance for adults 65 and older and some people with disabilities. You can switch from your marketplace plan to Medicare. More information is available here. Health care sharing ministry: Health care sharing ministries are not insurance plans; they are groups who share the costs of medical expenses. Unlike the marketplace, individuals can be excluded for a preexisting condition and held to requirements relating to Christian morals, such as refraining from alcohol and drug consumption. Finding this guide helpful? Subscribe to PublicSource’s weekly digest for more content to build a better, smarter Pittsburgh. 1. Your age determines your options. People 65 and older are eligible for Medicare, while people younger than 30 are eligible for catastrophic coverage — the least expensive insurance plan and the least coverage. Catastrophic insurance plans cover three primary care visits per year; everything else is paid out of pocket until a deductible is met. Children can be covered in family plans or under a federal health insurance program (more on that here). 2. Your income changes what assistance is available to you. You may be eligible for Medicaid or for savings in the marketplace. Before you shop, you can use the Pennsylvania Health Law Project’s Quickscreen tool to see if you are eligible for Medicaid. If your income is between 100 percent and 400 percent of the federal poverty level, you are likely eligible for a discounted health insurance plan. Use the HealthCare.gov savings tool to see if your household is eligible for savings. The Modified Adjusted Gross Income (MAGI) is your AGI + untaxed foreign income, non-taxable Social Security benefits and tax-exempt interest. For many people, your MAGI will be the same amount as your AGI. When you create an account on HealthCare.gov to apply for health insurance, the website will walk you through the income requirements and determine your MAGI. -For a more detailed look at your options based on income levels, see the infographics from Kaiser Health News here. 3. You’ll want to know what health insurance plans are accepted by doctors and providers you like. It’s a good idea to make a list of your current doctors and be sure they’re in the network before you make your health insurance selection. A doctor's office may accept your insurance, but if your insurance plan considers them out of network, you will likely have to pay more. Hey Pittsburgh, help PublicSource investigate health care and how the system could improve. We want to hear your story. 4. What health insurance providers offer plans for Allegheny County residents? Allegheny County residents are able to choose a health insurance plan from the following providers through the marketplace or directly from the health insurance provider. Your employer may offer a health insurance plan that is not one of the three listed above. In an emergency, go to the nearest hospital. Regardless of your insurance network, emergency room visits are covered at the in-network rate. 5. What is different for the 2018 open enrollment period? The 2018 enrollment period is six weeks shorter than the past two years. The Silver Level plans may be more expensive, but there are subsidies available to provide savings to some customers. Experts are recommending that shoppers compare plans at all metal levels. There is less funding for navigators and nonprofits to help with health insurance signups. HealthCare.gov has launched a new Help On Demand service to automatically connect a consumer to an agent or broker. Brokers work on commission. This year, some health plans have stopped commission payments, thus brokers would have incentive to steer a shopper in the direction of plans with a commission. 6. What do the plan levels mean? And everyone wants gold, right? This is one of the more confusing parts of shopping for health insurance. The metal levels only indicate how much your insurance plan pays for services versus what the individual pays, not the quality of care. In theory, an individual with a bronze plan would pay more for services at the time of care than someone who has a gold plan. The HealthCare.gov website explains that bronze plans may be good for someone who wants a low monthly premium and only wants to pay more if they have an emergency. Platinum plans have the highest monthly premiums, but you will pay less when you need care. Estimated averages for a typical population. Your costs will vary. Health insurance brokers and advocates are recommending consumers evaluate all levels of plans due to a change in subsidies (financial assistance). The subsidy changes are causing unexpected savings for some consumers. Many people are finding they’re able to get a bronze plan for less than projected or even free. According to a New York Times report, gold plans are cheaper or within $25 of silver plans in Allegheny County. If you’re shopping the marketplace and considering a silver plan, you should check the price of the plan directly with insurance providers. One broker noted that silver plans are often less expensive if purchased outside of the marketplace. You can use the Health Insurance Marketplace Calculator on the Kaiser Family Foundation website to estimate how much of a subsidy you are eligible to receive on a plan purchased through HealthCare.gov. Premium tax credits: This credit can be claimed in advance and paid directly to the insurance provider to reduce your monthly premium or you can receive the credit when you file your annual tax returns (or some combination of the two). You are eligible if your annual income is between 100 percent and 400 percent of the federal poverty level. The credit can be applied to any plan purchased through the marketplace, except for catastrophic coverage plans. You are eligible if your annual income is between 100 percent and 250 percent of the federal poverty level. 9. PPO. EPO. HMO. …HUH? Despite the confusion they cause, these acronyms carry important meanings. 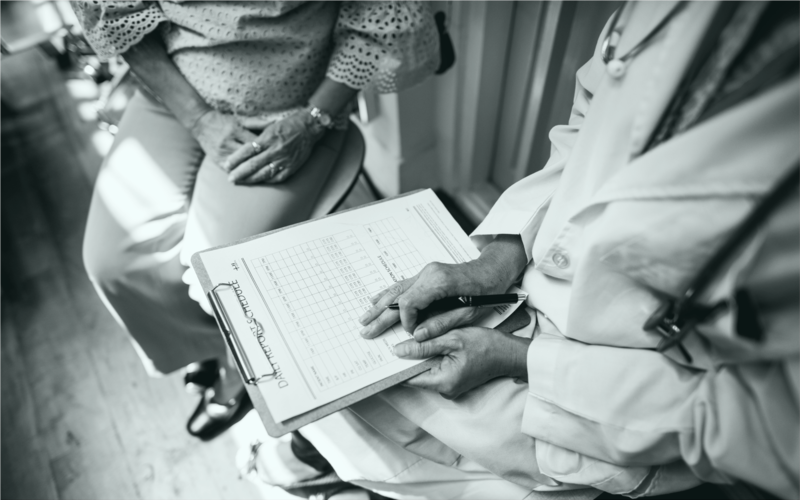 Below, we explain what they mean about the medical providers you would have access to and how many plans of each are available in Allegheny County. Most of the plans in the county are PPOs and EPOs. Health Maintenance Organizations (HMOs): HMOs often limit coverage to care from providers who work for or contract with the HMO. HMO members usually have a primary care doctor and may need to get referrals to specialists. Highmark has four HMO plans available in the marketplace. Preferred Provider Organizations (PPOs): PPOs give you the choice of getting care from in-network or out-of-network providers. You pay less if you use providers that belong to the plan’s network. If you have a PPO plan, you can visit any doctor without getting a referral. UPMC has 20 PPO plans available in the marketplace. Exclusive Provider Organizations (EPOs): An EPO plan requires you to use doctors and hospitals in the network. It does not require a referral to see a specialist. UPMC has 10 EPO plans available in the marketplace. YWCA Pittsburgh: Call 211 to schedule an appointment. Consumer Health Coalition: Call 412-456-1877 to schedule an appointment. You can also request an appointment by filling out the form at GetEnrolledPGH.com. North Side Christian Health Center: Call 412-321-4001 to schedule an appointment. PA Health Access: Call 877-570-3642 or use the form here to request help from a trained navigator. Pennsylvania Health Law Project: Call 1-800-274-3258 for assistance or email staff@phlp.org. You can enroll any time of the year. Even if parents’ income is above the Medicaid limit, children can be covered by CHIP. The Pennsylvania CHIP income ranges and rates chart are available here. For example, if the income for a four-person household is less than $51,168, the children in that household can receive CHIP coverage for free. To enroll in CHIP in Pennsylvania, apply through the Healthcare.gov marketplace, the Pennsylvania COMPASS system, by phone or mail in a paper application. There are three CHIP plans in Allegheny County: UPMC for Kids, Highmark and United HealthCare Community Plan of Pennsylvania. If your child has a Highmark plan, he or she will still have access to the Children’s Hospital of Pittsburgh. Though it is a UPMC facility, Children’s Hospital accepts all insurance in the region. Its website has an extensive FAQ on insurance coverage here. Individual Mandate Penalty Calculator - Enter your zip code and income, and you can compare the cost of the penalty you will pay for not having insurance to the cost of the lowest price plan in your area. VIDEO: How to Shop for Health Insurance from the Pennsylvania Department of Insurance. This video is from 2015 but provides a good overview of how to shop for health insurance in Pennsylvania. Be Well Pittsburgh - This website lists information for the uninsured and underinsured in the Pittsburgh area. Be Well has a list of information on health insurance options as well as lists of health insurance providers in the Pittsburgh area. Allegheny County Health Department resource guide for the underinsured or uninsured - This PDF offers advice for understanding your health insurance plan as well as an extensive listing of providers that offer low-cost care in Allegheny County. We tell in-depth stories for a better Pittsburgh.